For anyone who hasn't heard the story yet, that photo was snapped when, believe it or not, Rosie went on a road trip with my family and me when she was nearly 20 years old. At that time, was Rosie was doing incredibly well, despite her kidney disease. She took medications and received subcutaneous fluids on a daily basis, but she would not allow anyone but my mom and myself to administer such treatments. So, in order to ensure that Rosie remained on the treatments that were keeping her healthy and happy in spite of kidney disease, we risked taking her with us on a road trip to visit my uncle who lives a 10-hour car ride away. My sweet angel Rosie did wonderfully on that road trip. 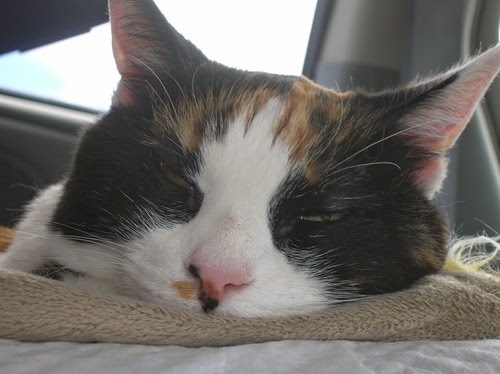 Though this is certainly not an ideal or recommended way of traveling with a kitty, Rosie remained perfectly content and happy if she could sleep on a lap while we traveled. We obliged her, driving with loads of extra caution for her precious sake. 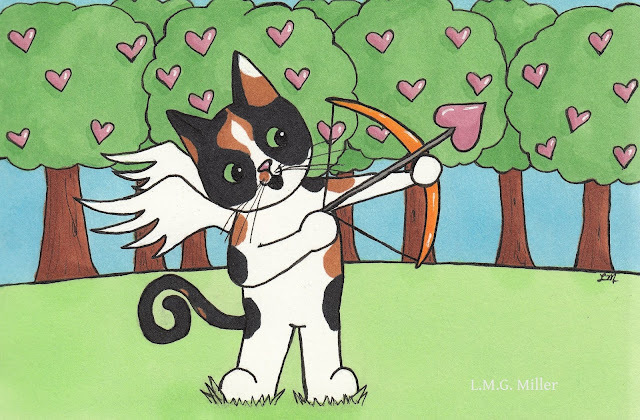 I felt compelled to share this flashback of my Rosie not only because I so very much enjoy the memory of her, but also because the first doodle in my Valentine's series stars none other than my sweet calico angel. After all, it only felt right to start my doodles of love for none other than one of my very first true loves. So, this one's for my beloved angel Rosie. Have a beautiful Tuesday, friends! We're continuing on with our tips for National Cat Health Month, today's tip being all about diet. As you all certainly know, not all foods are created equal. Always be sure to do your research and read labels, ensuring that you are feeding your kitty food that is as high-quality as possible. Also remember that cats are obligate carnivores, so make sure that their diet largely reflects this. In addition, when it comes to feeding your cat, it is of course important to take a number of other factors into consideration, such as their age and health status. For example, kittens do best on foods formulated for kittens, as these diets will include higher protein and fat content, which helps aid in their growth and development. As your cat ages, consider how their health will affect their dietary needs. For example, does your cat have kidney disease or diabetes? Cats with kidney disease should be on a diet lower in protein, in order to help their kidneys function as well as possible. On the other hand, cats with diabetes are often better regulated when on a diet higher in protein. Other factors that could affect diet include of course food allergies, dermatitis, arthritis, dental disease, and weight, just to name a few. The most important thing is to understand your cat's dietary needs based on their overall health status. Of course, as needed, discuss your kitty's dietary needs with their veterinarian, and make sure you understand what type of food would be best for them. A sweet story, sweet photo, and sweet memory. I find photos of Sammy still stir my heart and his memory always and forever will bring me to tears of love. Perfect doodle for Rosie! What a sweet memory. I bet Rosie enjoyed all of that lap time! What a pretty kitty, Angel Rose was! Angel Rosie was a beautiful girl. I think it is sweet you took her on the road trip and I am sure it is a good memory. Very cute drawing. Excellent tips too. Sammy is on a special diet because he has ideopathic hypercalcemia and I don't want him to get more stones. He had to have surgery to remove some two years ago. Thanks for sharing your wonderful memory of your sweet Rosie. At twenty years old and going on a wonderful road trip. Such a great time with the family for you all. Thanks for sharing the great doodle. Have a wonderful day. Rosie was a very beautiful kitty. It's easy to see why she was so special to you, and I love that you took her along on your road trip so she could get her meds from you. That's true love! We had a cat that needed subcue fluids daily, so i know how hard you worked to keep Rosie with you and comfortable on that trip. You are a fabulous kitty parent! Rosie looked very content in that photo...probably because she knew she was with you.